I’ve been rather hush-hush on the Resort collections. There’s been a lot grabbing my attention (looking at you Gucci and Valentino), but I just wasn’t ready to jump on my blow horn. Then one of my low-key favourites wowed me with some crazy prints, fish skins, and sustainable fashion. Osklen, you have my heart. Oskar Metsavaht has always been very eco-conscious with his collections, and this collection is no different. In fact it might be the crowning achievement. There are fish skin accessories for example, specifically pirarucu skins. The people of Brazil eat this fish (also known as the arapaima) and just discard the skins, but Metzavaht contacted the farmers to use the castoffs. Voila! A skin with a cause. This relationship helps keep the pirarucu from becoming endangered, and pours money back into the Amazon. 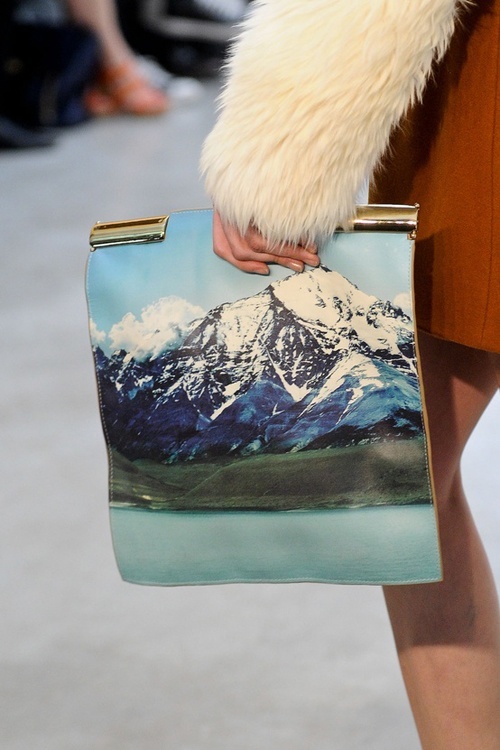 I first discovered Osklen in Fall 2013 with a beautiful collection inspired by mountains. Hold up. I love mountains! I come from a famously mountain-loving family, so when I saw mountain scenery plastered on shirts and clutches, I knew this designer sang the same song I did. Every collection is a direct nod to nature. It’s like something a socialite who climbed K-2 would wear to a gala. That’s the kind of socialite I would be. This new collection definitely departed from the “higher fashion” elements Osklen usually has (heavy embellishments, crazy imagery, etc), but the fabrics speak volumes. As it’s a resort collection, why not take a more laid back approach? In fact, why don’t more collections do that? I personally don’t want to wear a ballgown, high collars, or 20lbs of sequins in the summer. I want to be light and airy on a beach in the sunshine (under an umbrella to protect my vampiric complexion). Overall, I am in love with this collection. The linens, silks, and cottons in the richest of earth tones. Flowy silhouettes that suit a tropical bungalow just as easily as a cocktail party. The “cool girl chic” versatility appeals to me. Obviously, it’s not for everyone, but boy oh boy, it’s for me.